Bay Sessions kicked off its first concert series at the Loews Coronado Bay Resort. Situated on the hotel’s terrace with a spectacular view of the San Diego skyline. The stage was set for a line up of exceptionally talented bands on the Redwoods label roster that included Dani Bell &The Tarantist, Cardinal Moon, Birdy Bardot, The Midnight Pine and Rebecca Jade & The Cold Fact. Press Pass LA sat down with several of the nights opening bands. As a collaborative team, Bennett and Howard both write the lyrics for their songs. When asked how they would describe their genre of music. “I think the word cinematic folk, rock with elements of soul with rock and roll. And some country influences,” says Bennett. The next band, Cardinal Moon also involves musician Alfred Howard. Lead singer Dawn Mitschele shared how one of the local DJ’s in San Diego made that connection happen almost two years ago. “Al contacted me after he heard me singing on the radio,” says Mitschele. At the time, Howard was about to board a Greyhound bus. But that did not stop him. Howard sent Mitschele lyrics via text message. Mitschele then recorded on her iPhone and sent it back to him. And the rest as they say is history. Make sure to check out the weekly Bay Sessions on August 28th, September 18th and September 24th at the Loews Coronado Bay Resort. The Bay Sessions is definitely worth the trip to Coronado. The best part- it’s completely free to the public. 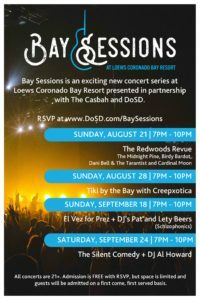 Bay Sessions in collaboration with the The Casbah & DOSD is located at the Loews Coronado Bay Resort.